Technology from Imagine Communications proved successful in an unusual challenge at Autodromo Nazionale di Monza in November 2018. 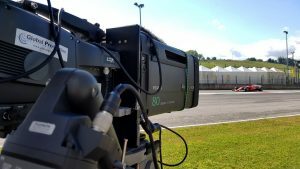 Its systems power the new live Ultra HD production truck operated by Global Production, which took part in an extensive trial organised by Ferrari as part of its Ferrari Challenge World Final (1-4 November 2018). This trial determined who could deliver the most consistent and accurate live colour images across all resolutions — including, of course, Ferrari’s trademark red. In the tests at the Ferrari Challenge, the Global Production truck beat the competition during a competitive colour accuracy test. It delivered the most accurate rendition of Ferrari red to viewers watching on all standards, from SD and HD to Ultra HD in 4K and HDR. Aside from the test, Global Production was providing host broadcaster coverage of the four-day event for Sky Italia, RAI and other broadcasters around the world. The tests demonstrated the power of the Imagine Communications hybrid infrastructure, built around the Selenio Network Processor (SNP). The platform offers SDI/IP gateway functionality and all-IP-capable processing with instantaneous conversion capabilities between environments. The significance of this demonstration is that the SNP enabled Global Production to support hybrid SDI-IP workflows, while protecting the integrity of its mission-critical signals. At the core of the truck’s infrastructure are four SNP units for processing and HD/UHD up- and down-conversion, which also serve as a bridge between uncompressed IP signals in SMPTE ST 2110 and the SDI infrastructure. All connectivity, in SDI as well as IP, is managed by the Magellan SDN Orchestrator software control system, allowing the production team to switch and interwork between HD, Ultra HD and uncompressed real-time SMPTE ST 2110 streams. The result is that the production capability is implemented in a tenth of the rack space normally required. This is a critical advantage in achieving the capacity necessary. Without it, Global Production’s goal of full functionality, including 30 true 4K Ultra HD camera capability, simply could not have been achieved inside a road-legal vehicle.